Atlantis & Ancient Civilizations: Cyrstal Skulls - Art or Ancient Tools? Once again proud to announce more to intrigue the mind! A new article written with the aid of DaEl Walker. Mr. Walker has researched the Ancient Crystal Skulls for more then 20 years & is currently care taker to five such skulls. With the aid or DaEl Walker, this newsest addition, we feel, raises questions & thoughts not previously addressed in publications. ... Crystal's recording information and retaining it for future use? Impossible! Not really, at this moment you are reading information that I placed on a computer and then stored in a 'world' called the 'net'. I am able to do that and you are able to read it, with the help of sliced quartz microchips in the computers. DaEl describes both Rainbow and Madre as such recorders. It has also been reported that the Mitchell-Hedges Skull has this ability. Why don't the others show the same properties? Are they broken like a corrupted hard drive on a computer? I don't believe so. Each skull is made with different types of crystal. Would it be so 'out of the box' to think that a civilization who could produce such effects would actually know what they were doing? Different types of quartz have different 'frequencies' or 'vibrations' unique to their composition. It only makes sense that the creators of these remarkable artifacts would have understanding of that fact. [Discussing Rainbow] "You describe her as a 'recorder', which I have read much about. I read that you have learned to use colors/sounds to operate her & that you have learned enough to be able to stop & then continue on the same sequence of info using these techniques. Ok, well turning on a computer is easy enough, roaming the web...not to difficult, learning html, java, php, etc... a lot harder but I have done it so it doesn't take a specialist, just effort & desire. I am thinking the same for Rainbow & the others as well. If we relate them to computers storing info, then they need to be usable by the general population of whoever created them. This would just be common sense. We also, in today's world, have many different types of computers. I can operate mine, but would be lost on some government mega-puter or a doctors ultrasound. With time & patience I could figure them out, but without instructions it would be extreemly difficult." I have a couple of excellent crystal skulls, one of them a smaller Max (which Parks, who owns the Max said was an excellent duplicate) - they are very interesting. Many years ago I was with a huge group of channels who channeled Max and the other skulls. They shared information about all of the skulls, the thirteen of them that had been specifically encoded, and proceeded to tell us what was in them. Max is about 10,000 years old, and was found in a tomb in St. Augustine, Guatemala, between 1924 and 1926. He was used by the Mayan priests for healing and prayer. So, these skulls have been used, and are being used by the general public. They are handled by the public, generously. I don't like the idea of exclusionism mentioned in your post - that it has to be activated by certain people's minds. All it takes is an open mind and allowance, and being an aware channel could help a bit more. Knowledge is for everybody who wishes to tap into it. Now, when it comes to integrity, there might be an issue as these crystals are not to be toyed with lightly. While I will agree it just takes an open moind, I will also believe that morals do play a high part as well. The sad truth is tho, in today's age, open minds are in the minority & those who think for themselves, fewer. I believe the mind must not only be open, but be creative, well exercised and used to work with such unknown techs. 13 Oct 2007 @ 18:59 by Knights Templar @66.188.11.36 : THE SECRET REVEALED ! I have found it, the answer to it all. This website has the answer! The crystal skulls was used by the fallen angels and the offsrping of the angels of Genessis 6. These beings are the ones who dwelled and lived at atlantis & Lumeria. They lived almost to 1000 years old do you even know how advanced they could have been. These people built whole civilizations 200 thosuand years ago. The crystal skulls was used for demonic worship, Atlantis was the cause of the downfall of Humanity in the East. The Garden of Eden is apart of Atlantis. The star it formed is called the star of david, the reason the star of david is demonic is because the Atlanteans used it 200 thosuand years ago they are the government of today serpent shapeshifting men. The star of David these so called Jews have was a set up by the government. Nowhere in the Old Testament it talks about a Star of David. Alot of the occult and free masonic organizations that we know of today go back to the Atlanteans and Lumerians downfall. They stoped worshiping Yahweh and started worshiping made up demonic idols. 200 angels had fell , they were the real orginal keepers of Genesis. They are the evil governments now. I have seen only two of the skulls first hand. Their "magic" is far older than we care to know or understand. My family has discussed the skulls on occasion, and find that the colore skulls hold the most fascination for us. Wheteher it is the gray, black, red, sand, white, yellow, etc skull, each seems to find a mark within our individual family members. Perhaps our ancestry can be the answer as our children are of Welsh/Irish/Scot (aka) Celt descendency through me and Cherokee, Objibwai, Ute, Irish, Spanish descendent through my husband. Our eldest has always been drawn to the Black skull and is extremely sensitive to all aspects of the paranormal (she cannot enter a cemetery and was psychic witness to the final moments of those who died in the Murrah Bldg in OKC, Oklahoma in 1995, as well passengers on Flight 93 on 9/11). I am drawn to the yellow skull being a conduit for others in the paranormal realm of communication, being able to talk to "the others" directly as I would speak to a living person and being an "anchor" for my eldest. Whether we have direct or indirect contact with the skulls, once we have seen them 'in person' they are forever a part of us and those who shareour bloodline. 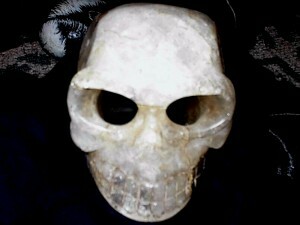 Recently I became caretaker of a clear quartz skull with removable jaw. I have learned in the one month of working with "her." My intentions are the key to making the transmission of information possible. I do get some visions but have learned, after some serious deep healing and dealing with past issues the skull speaks to the heart and communicates with the intentions of the heart. There is no time or human morality, this is for the ones that are willing to dig into themselves and clear chords and prepare for a vast amount of energy. Purposeful intentions and clear motives are imperative. If the heart is cluttered with "junk in the trunk" then the energy either will not be able to flow or will be just as diffused as the caretaker. Time,for us, is speeding up, personal work is more important than crystal workshops it you are not ready to download that much information. This path might be popular but has it's risks. These skulls have "NO" time and do not have our human morality so a positive clear heart is mandatory, in my humble recovering and healing heart opinion. Bless you all. 7 Mar 2002 @ 13:32: Sea's Mind - UFO's - Fact or Fiction? 10 Dec 2001 @ 12:43: An ancient DISGRACE!!!! [< Back] [Atlantis & Ancient Civilizations] [PermaLink]? [TrackBack]?